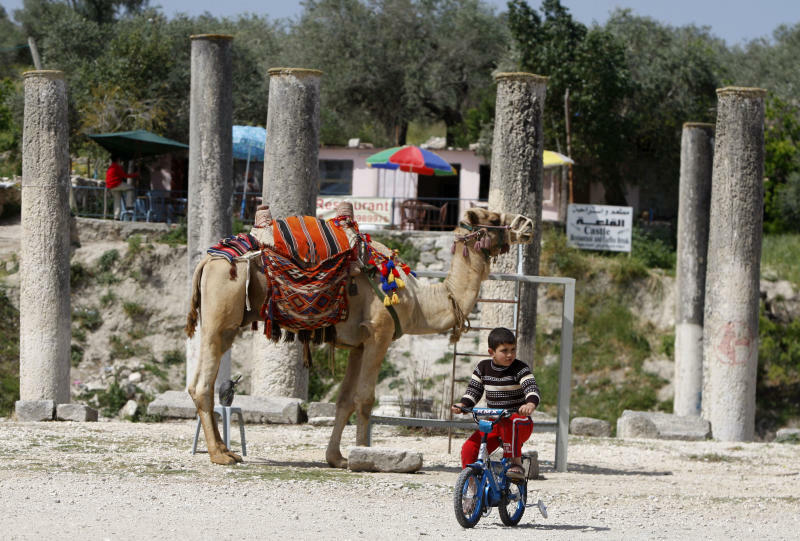 SEBASTIA, West Bank (AP) -- The ancient town of Sebastia is one of the major archaeological sites of the Holy Land, with its overlapping layers of history dating back nearly 3,000 years. But today the hilltop capital of biblical kings, later ruled by Roman conquerors, Crusaders and Ottomans, is marred with weeds, graffiti and garbage. Caught between conflicting Israeli and Palestinian jurisdictions, the site has been largely neglected by both sides for the past two decades. Beyond the decay, unauthorized diggers and thieves have taken advantage of the lack of oversight to make off with priceless artifacts. "You can learn the history of the whole region (by) staying here because all the powers that crossed the region since the time of the Egyptians were passing through," said Carla Benelli, an art historian who has been working on restoration projects in parts of the site, financed in part by the Italian government . "From this point of view, it's really very important." But the site needs basic maintenance, protection and cleaning, she said. "There is no one who is doing this here in Sebastia. It will not last forever in this way." The ancient greatness of Sebastia — located in the northern West Bank just outside the city of Nablus — remains visible. It served as the capital of the biblical Kingdom of Israel under the name of Samaria in the 8th and 9th centuries B.C. Alexander the great, King Herod and Medieval Islamic rulers have all left their marks. According to tradition, the town is also the burial place of John the Baptist, revered by both Christians and Muslims. The remains extend from the present-day Palestinian village of Sebastia and up a nearby hill to the site of the ancient capital of Samaria at the top — around a square kilometer that includes a Crusader cathedral, an ancient Roman city boasting a forum, a colonnaded street and a temple to Augustus, and the remains of the palace of Omri, the 9th century ruler of the Kingdom of Israel. Therein lies the problem: Most of the ruins lie in areas under full Israeli control, with some in areas under Palestinian civilian control but shared security responsibilities under the 1990s peace deals that divvied up the West Bank into zones of authority. The Palestinians claim all of the West Bank, captured by Israel from Jordan in 1967, as part of a future state. The situation deteriorated greatly with the outbreak of the Palestinian uprising in late 2000. Although the fighting has ended, care for the site has since dropped away because of security fears. Visits by Israeli citizens need to be coordinated with the Israeli military. Israel's Civil Administration — the military body that oversees civilian affairs in areas of Israeli control in the West Bank — said that conservation and development works were carried out by Israeli authorities at the site in the 1990s. But they were halted "due to the change in the security situation," it said in an email to The Associated Press. Technically, the Israeli-controlled part of the archaeological zone, centered on the hill, is under the authority of Israel's Nature and Parks Authority. But there's little sign of a park, with no staff visible, and there's no fence around the site, leaving it open for people to enter. The parts under Palestinian control, centered on the village and up to the foot of the hill, have also had little supervision or care. "Sebastia, the archaeological site, is abandoned without any control from 2000. It's 13 years," said Osama Hamdan, a Palestinian architect who has coordinated the restoration works of Crusader-era buildings with Benelli. "In this period really Sebastia is suffering a lot because a lot of illegal excavations have happened in this area. A lot of destruction of cultural heritage in this area has happened," he said. Statues, vases, coins and glasses have all been taken by looters, he said. Weeds grow freely among the archaeological ruins, sticking out from the ancient stones. Plastic bottles and food bags are littered at the bottom of the staircase that leads to a Crusader cathedral — also site of a mosque — where the tomb of John the Baptist is said to be located in the village of Sebastia. Finely decorated stone Roman tombs in the center of the village are smashed and abandoned. At a Byzantine church dedicated to John the Baptist, located in the Israeli-controlled part, graffiti hailing the Hamas militant group is spray-painted on a column. The Islamic expression of faith — "There is no god but God" — is written in Arabic over the entrance. Hamadan Taha, assistant deputy minister in charge of antiquities in the Palestinian Authority, acknowledged that looting is "a major problem" and said the Palestinians are making efforts to combat it by working with local officials to raise awareness. Sebastia "has a great potential to be developed as tourist attraction," he said. With the help of international donors, the Palestinian Tourism and Antiquities Ministry has built an "interpretation center" near the Roman forum at the foot of the hill which Taha said will provide services to visitors. It is expected to open in the coming months. U.S. Secretary of State John Kerry, who is trying to revive peace talks between Israel and the Palestinians, has identified tourism as a key area for Palestinian economic development. Israel's Civil Authority said it has been trying to coordinate efforts at the site with the Palestinians, a claim that Taha said was untrue. Israel's Nature and Parks Authority, which calls Sebastia the "Shomron National Park" on its website, declined comment. Two major archaeological digs were conducted in Sebastia in the early 20th century, when the site was controlled by the Ottomans and later British authorities. In addition, smaller excavations were conducted in the 1960's by the Department of Antiquities of Jordan, when the site was under Jordanian rule. "It's beautiful, it's a fantastic place. And the landscape is marvelous" said Axel Wernhoff, a Swedish diplomat visiting the site for the fifth time in a recent tour by a group of foreign visitors accompanied by Benelli. The group touted the archaeological remains, stopping occasionally to admire the views of the valleys below with their olive and fruit groves. Hafez Kaye, a local shop and restaurant owner, said that after a difficult decade, business has begun to pick up over the past three years. "Slowly, slowly it's coming back. From the year 2010 until now we are receiving groups again and we hope to come as before."